Many people refer to the combination of bifascicular block with a 1st or 2nd degree AV block as a ‘trifascicular block’, this term is obviously incorrect as a block of all three fascicles should result in complete heart block. Further to the inaccurate nature of the term the AHA 2009 Recommendations for the Standardization and Interpretation of the Electrocardiogram specifically recommended the term ‘trifascicular block’ not be used due to the variation in anatomy and pathology producing the pattern. 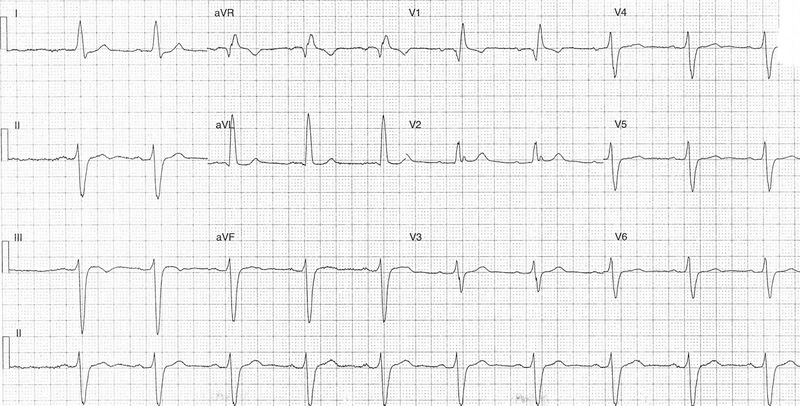 On this surface ECG it isn’t possible to tell whether all three fascicles are affected as the pr prolongation may be due to disease at the AV node, the left posterior fascicle, or the His bundle. The AHA 2008 guidelines for PPM insertion are clear that an incidental bifascicular block with pr prolongation in the asymptomatic patient does not warrant PPM insertion (LoE: B, Class III recommendation) but in the setting of syncope are an indication for PPM insertion. Given history of near syncope this patient needs cardiology referral was consideration of PPM insertion.